As the weather turns cooler and the days get shorter, I welcome my favorite season and crave being in the kitchen with the stove on. I love baking even more than usual when the fruits of late summer-early Fall beckon me to create gorgeous fruit-filled pies, cakes and tarts. Now plums are on their way out, and apples and pears are just starting to appear at the farmer's markets. Fortunately for me, there seems to always be an excuse to bake something. Like the backyard party we went to recently to which I took two homemade apple-plum pies. I am always trying new recipes, especially for pie crust. This one is from Dorie Greenspan, a true expert on all things baked. Hers is for an old-fashioned mixed-apple pie. I tweaked it to include the plums and and left out a couple of things hers included in the filling, like tapioca and raisins, mainly because I didn't have them. I think the 1/3 cup of vegetable shortening in the crust is what makes it "old-fashioned." You could leave it out, but it really does give an extra flakiness to the pie crust. Everyone loved it at the party. It was a great complement to the end of summer fare the hosts provided for the last BBQ of the season, things like corn and bean salad, hot dogs and burgers, potato salad and beer. I would serve this pie just as it is, with a small dollop of vanilla ice cream on the side. Make dough using the food processor method (dries first, then add butter + shortening by cutting in and pulsing until it looks like cornmeal; then add ice water and blend until moist clumps form, adding more ice water if dough is dry). Gather dough into ball and divide in half. Flatten each disk, wrap in plastic and refrigerate at least 3 hours. Butter 9-in pie dish. Roll out dough onto floured surface to 12-in round. Transfer to pie dish pressing down on sides and bottom, allowing overhang to extend over sides. Roll out second piece (for top) and chill both on baking sheet while preparing filling. Preheat oven to 425. Combine apple and plums wedges, 1/3 cup sugar, raisins, tapioca, lemon peel, salt and nutmeg in bowl. Toss to coat fruit and let stand about 15 min. Transfer filling to crust, mounding slightly in center. Dot filling with butter cubes. Brush edges lightly with water. Transfer second dough round atop filling; trim overhang, press edges together, then fold under. Using tines of fork, press on crust edge around rim of dish to seal. Cut some 1-inch slits with a sharp knife in top crust to allow steam to escape. Brush top lightly with milk or water and sprinkle with raw sugar. Bake pie 15 min at 425. Reduce oven to 375 and continue to bake until crust is golden, apples are tender and juices are bubbling over, about 50 min. longer. Let cool to lukewarm or room temperature and serve. For more fall recipes, see this pretty apple cake, or this post with some of my Fall favorites: chard gratin, moroccan sweet potatoes and farro with chickpeas and butternut squash. Why is it that there is something about every place I've ever lived (and that is a pretty long list now) that just leaves me wanting in some way. There's something lacking that's elusive and I can never explain to anyone what it is exactly, but I know it's just not there. I've lived in Rome, Florence, Boulder, CO., Oregon, Seattle, Las Vegas and now Nashville, TN. But none of them can compare to New York. You know I'm not talking about quality of life, or beauty, or weather, community or the cost of living. All of those things can be found in other places and the places I've lived have New York beat on all of those fronts. But what matters to me most--the deal breaker of all deal breakers-- is the FOOD. And for this, New York must be the best city in the world. I've been many times before and have always had great food, but no other trip was as packed with fantastic dining experiences as this one. We had four days and four nights of amazing meals, all of them a tribute to this gastronomically great city, and all of them a result of my brother's uncanny ability to be at the right place at the right time. It was his 40th birthday that occasioned this weekend in NYC with the whole family. And it was perfect that we spent it with him in his world, eating in his favorite places (all places where he's worked) and meeting the people who have influenced him on his new path of culinary discovery. I couldn't be happier for him. So it was that the first night started out with one of the simplest and best meals of the weekend. Greg worked at Vinegar Hill House in Brooklyn when it first opened, less than a year ago. His friend, the chef and co-owner, Jean Adamson was the chef at Freeman's where he bartended for a couple of years and where he first started to love food. Jean played a big part in that. She is the kind of chef I would like to be if I had those professional ambitions. She's competent, super skilled, understands seasonal food and classic preparations and is at once sweet and modest, capable and confident. A strong woman in a man's world. I will let the real food critics' reviews do the talking, (Frank Bruni wrote about Vinegar Hill in August) and I'll just tell you briefly what we ate and enjoyed. There is a lot of great food to talk about here, so get ready. A plate of farmstead cheese and salami with homemade crackers and pickled quail eggs was brought to the table first. It was perfect in every way. Then we had some salads: shaved market vegetables, little Japanese eggplants that were so simple and good, a watermelon salad with feta, olives and mint, a roasted corn salad and a simple plate of some of the freshest lettuce I've ever tasted. It was all beautiful and the ingredients really stood out as farm fresh and local. Indeed, we ran into Jean the next day at the Union Square Farmer's Market buying produce for that evening's menu. For mains, we had housemade pappardelle with pork sugo, an amazing cast iron chicken, and what is arguably their most popular dish, the Red Wattle pork chop (above) that melted in your mouth. I think there was a fish on the table too but I don't even remember it. I do remember the desserts, however. A specialty of the house: rich chocolate Guinness cake and my favorite, an almond cherry crostata that was the perfect homespun ending to that meal. And that was just the first night! Day two was spent walking around in Chinatown and Little Italy, where I visited DiPalo's Market and the historic Alleva Cheeses. Then we made our way uptown and strolled through the Union Square Greenmarket where the produce was practically jumping out of the stalls it was so attractive. It didn't hurt that it was a picture perfect Fall day in New York. We had lunch at a little walk-up pizza place where they served beer in 32-oz styrofoam cups and you sat on the sidewalk with loads of others lining up for a slice of their namesake artichoke and spinach pie. Dinner was a treat of the sort that's hard to duplicate anywhere else except at Roberta's in Bushwick, Brooklyn. Carlo Mirarchi, the chef, and his partners own this club-house for foodies where a wood-fired oven brought from Italy fires out pizzas day and night, and a continuously evolving roster of meats --lamb, pork (heavy on the pork), beef, duck and chicken vie for space on the picnic table in a lively, young atmosphere. Wine is poured by knowledgeable servers into little mason jars and out back the shipping container used to ship the oven now holds a studio where the Heritage Radio Network presents webcasts on all things food and farming, and an organic garden sits on top. I blogged about Roberta's when I visited my brother last November. I thought it was great back then and it's only gotten better. This place could not be anywhere else but in an industrial area of Brooklyn where creative people with heartfelt ambitions get together and roast a pig for fun or, with help from a donation from Alice Waters, fund a greenhouse on top of a shipping container in the back of the restaurant, soon to expand to more gardens that will supply all of the produce for the restaurant. Talk about local. It's is such a cool and inspiring place. Oh, and the food. Read more about it here, but let's just say we rolled out of there happy and stuffed and well taken care of. Carlo brought us a salumi and cheese plate first, followed by apples with bacon and walnuts, then a delicious testa (pig's head) ravioli, and then a remarkably good tripe in a spicy ragu that was as good as any I've had in Italy. We thought that would be it, but the formidable chef Carlo wanted to do something special for my brother who used to work beside him in the kitchen when they first opened, and brought out the largest pork shoulder I've ever seen. Slow cooked all day, it was perfectly charred on the outside, soft and juicy and falling apart on the inside and served with dark greens and tiny fingerling potatoes. An awesome dish. 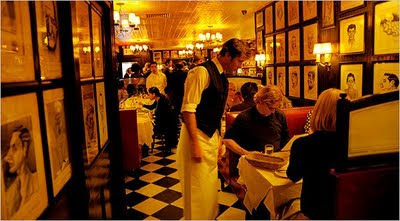 And now, for the grand finale: My brother's birthday dinner at Minetta Tavern. To say that we are lucky, again, is an understatement. This place was reviewed and given 3 stars by Frank Bruni recently, who says they are "serving the best steaks in the city" right now. (Listen to his own words and see the pics here, since I was too enthralled and the lighting to dark to take any). this photo courtesy of the NYTimes. It is impossible to get a reservation at this West Village hot spot and the celebs and big shots flock in to experience the latest in the Keith McNally empire of NY restaurants. A Paris bistro meets old timey New York steakhouse where the ingredients and execution are near perfection and the atmosphere is infinitely more fun than a stuffy white tablecloth dining room. We started with a glass of bubbly and a dozen Long Island oysters. Appetizers included an heirloom tomato salad that was superb in its simplicity, squid stuffed with salt cod, peppers, olives and preserved lemon, eggplant salad, steak, veal and lamb tartare and oxtail and fois gras terrine. We could have stopped there and it still would have been one of the best meals I've ever had. But what came next exceeded all my expectations for what steak should taste like. First they brought out their famous Black Label burger with carmelized onions and pomme frites. We cut it into five pieces and raved. Then, the piece de resistance: a Dry Aged Cote du Boeuf with roasted marrow bones that they presented to the table whole and then returned with it sliced. And did I mention the tender New York Strip that accompanied that? It was more meat than I've ever seen, much less eaten. I've never tasted beef so melt-in-your-mouth good. They are justly famous for this and it is the way steak should be prepared, cooked, presented and enjoyed. Perfection. I won't go into the chocolate soufflé or the pistachio gelato or the chocolate, coffee and vanilla pots de cremes. To say this was one of the better meals of my life would not be an exaggeration. I felt like it was MY birthday! I know my brother enjoyed it too. It's always fun to be on the other side of the house pretending to be a customer in the place where you toil for hours sight unseen. I am so proud of him for being a cook at Minetta and working in a kitchen of that caliber. I met his chef, Riad Nasr, earlier in the day when we ran into him on the street. He seemed too nice to be such a killer chef. But that must be what makes it all so successful: there is so much heart in the food and pride in the place. An all-around superb dining experience. Whew. I'm too tired and this is too long to go on about the other places that we visited during the day: Babycakes and Orchard 88 coffee, Ninth Street Espresso, The Donut Plant, La Esquina and Prune for lunch. What a culinary tour of delights. After all that, my stomach may need a break, but my heart is still in New York. I'm still in produce surplus mode. Gearing up for a trip to NYC this weekend and knowing I won't be able to use all the beautiful veggies that arrived in my market basket this week and feeling strapped for time. This shining purple eggplant really tugged at my heart strings, though. "Do something with me, please! Don't let me go to the compost heap!" Eggplant and peppers in garlic oil. Oh how I look forward to cracking one of these open some cold day in January and spreading it over bruschetta with goat cheese, or layered onto a homemade pizza margherita. Or just offered up alone on a dish as an antipasto for guests. I have a book called "Preserving the Harvest" that has been my go-to tome for learning about canning and freezing the summer's bounty. I have made strawberry-rhubarb jam, pickled peppers and shallots, and now this. All have been wonderful canning recipes and great ways to use the produce that's lingering around in late summer. I roasted the sliced, unpeeled eggplant under the broiler for about 20 min. Then I did the same with the peppers until they browned nicely and softened. The peppers were beautiful to begin with, most of them from our farmer and a few stragglers from our garden. but coming out of the oven with their skins blackened and smelling sweet they were even better. I let them cool in a brown paper bag, then peeled and quartered them. While they cooled, I heated a cup of olive oil, 3/4 cup of vinegar of any kind, 3 garlic cloves, chopped, and a teaspoon of red pepper flakes. Simmer that for about 5 minutes. Then, in 3 clean mason jars, I layered the eggplant and the peppers with large basil leaves in between. Then I poured the hot garlic oil over each jar until it comes up over the veggies but leaving about an inch of headspace. I did not process these jars because I only made three and will give one away to a neighbor. They will last unopened in the fridge for a while and I don't think we'll be able to wait much longer than that. If I had wanted to store them long-term, I could have processed them in a hot water bath canner for 20 minutes. On another occasion, I might have made this with my eggplant, like I did a few weeks ago. Melanzane alla parmigiana is one of the best ways I know to eat this late summer veg. I learned mine from Carla the Tuscan cook last Fall and it is particularly cheesy and delicious, a typical Sicilian dish made with several types of cheese, not necessarily parmigiano. I happened to have mozzarella and pecorino on hand and they blended well. The key is using your own homemade tomato sauce and I don't bread or fry the eggplant first. I slice and roast it in the oven on 400 until it's soft and lightly browned. Then, layer the eggplant slices with the tomato sauce and cheeses, add some fresh basil for color, and bake until bubbling and delicious-looking. If you're like me, you enjoy using different recipes for the same thing and never making the same dinner twice. I make a different pie crust almost every time I make a pie - which is pretty often. I also always seem to try totally new (and sometimes) challenging things when I've invited people for dinner. So it's never dull in my kitchen. But sometimes when the summer nears the end and the veggies just keep on coming, I find myself getting tired of always coming up with new ways to use that yellow squash that never stops. This post is about some of the more successful ways I've used the surplus of produce this summer--dishes that I may just have to repeat next year. This soup was light and easy to make. It starts with sautéeing onions and yellow squash with thyme until soft, then adding vegetable broth, puréeing it, and adding a dollop of heavy cream at the end to give it balance. I sautéed the shrimp separately in olive oil and chile flakes just until done and added them to the soup with fresh basil and a drizzle of sour cream or creme fraiche before serving. Super easy and super fresh. I got tired this summer of eating corn on the cob so I started grilling or boiling it and and adding it to salads and slaws for extra crunch and sweetness. In this particular salad, I cut the corn off first and sautéed it in butter for just a few minutes before adding it to the tomatoes. A revelation. Corn does not have to be boiled! It was the perfect complement to this sausage and pepper sandwich. For another great summer salad recipe with corn, see my "farmer's salad" from an earlier post. This is by far my favorite way to use potatoes in the summer. I learned how to make it while traveling in Spain when the gardener at the house where we stayed would bring potatoes and huge yellow onions in from the garden each day expecting us to know what to do with them. I learned quickly that this is the classic combination of these two ingredients and I never got tired of eating it. It's just a fritatta really, but the key is slicing the onions and the potatoes thinly and frying them first before adding the lightly beaten eggs. If you use a large skillet it can be inverted onto a plate pretty easily and then cut into pie-like wedges. In Spain they serve it cold or room temperature, drizzled with a good olive oil or dolloped with a dill sour cream. Serve alongside a simple green salad for the perfect summer lunch. I found this recipe by Molly Wizenberg in bon appetit and loved the sound of it. I had a bunch of different kinds of peppers that made it really colorful. I really got into the canning this year and 'put up' 4 jars of of these peppers as well as a couple of jars of sweet pickles. I haven't tried these peppers yet, but I look forward to opening them up in the middle of winter for a fresh taste of summer veg! **If you have a garden or joined a CSA this year, what are some of your favorite ways to use extra produce? As much as I love vegetables and enjoy eating seasonally and learning what grows where and when, I don't remember ever thinking this way when I was young. I didn't grow up on or even near a farm and come to think of it, neither did my parents. We just didn't have that context to draw from when thinking about food. But my mother was Italian and her family did preserve many traditions surrounding food that informed her cooking in an interesting way. For example, these green beans that were one of my favorites. Whether we ate them in winter or summer, they were readily available like most produce. But now that I know they are a staple of late summer, I look forward to preparing them in my own kitchen as soon as I see them in the market. They almost have a Fall-ish taste to me now too. Maybe that is because they combine the produce of late summer--tomatoes and green beans-- and for me, somehow mark the transition from one season to the next. 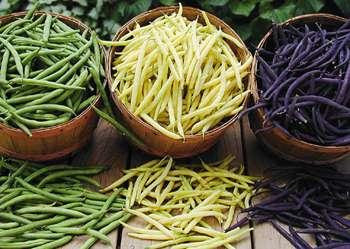 There are many different varieties of green beans --some of them not even green, but yellow and purple, though they taste exactly the same. I prefer the ones sometimes called 'Italian green beans' or Romano beans --the long, skinny green ones--for this recipe. But I did find out recently that the purple ones turn green when you cook them anyway, so if you have these now in your CSA basket like we do, go ahead and use them for this recipe. They need to be cooked only briefly so they retain their snap. My mom may have been guilty of cooking some vegetables overly long, as was the style in her day. But these green beans she cooked just perfectly and used just the right amount of chunky tomatoes and onions. She sometimes served them along with Italian sausage and that is what I was trying to emulate in this dinner. I love the way our taste memory can take us back to some earlier time when we enjoyed something in exactly the same way. When I took the first bite of this dish, all of those flavors combined in a way that transported me back to when I was young and first discovered how good a fresh green bean can taste. Start by sauteeing garlic and onion in olive oil. If adding peppers, add them now and let cook another 5 min. When softened, add the chopped tomatoes and cook for about 5 min. Add the green beans to the tomatoes and onions and cover skillet with a lid. Let them cook until still al dente and mixed well with the other ingredients, about 7 min. In another pan or on the grill, heat sausage and brown for a few minutes. Season green beans with salt and pepper to taste. For a perfect meal, serve with sausage and some good crusty Tuscan bread on the side.